I would say it was when I first started networking to market the book. I am not a prolific writer, but I”m a still a writer. What’s the earliest memory you have of writing a story? About eight years old. I tried to write a screenplay for the Pokey Puppy. My freshman English teacher was the first person who showed excitement about a good story that inspired me to write better. My very first attempt at co-writing a story was in my 30s. My partner dropped out. I was on my own. I came to a part where I really loved my character and she was in a bad situation. I didn’t want to destroy her and so the story has remained frozen forevermore. The rewrites. I hate do-overs. I take a deep breath. I don’t have a pride problem More of a self loathing that I didn’t do it right the first time. What technology do you use for writing? It varies. I’ve discovered Scrivener and use it with Dropbox. Love them both. Mostly it’s whatever text software I have handy. I’ve been using Google Docs lately as I can pick up my story on any computer. How do you keep from resenting your duties and every human’s sleeping requirement when you have to stop writing to take care of them? They are saints and forgive me for giving them dirty looks and I remind myself that I will not be remembered for writing a book when I’m dead. The memories are those I make with them. Memories are not made behind a keyboard. Sporadic, procrastinated, competitive, embracing my nightmares. They can only read my book in the daylight. Blackstone Resorts, built in 1842, only opens its doors to invited guests once every eight years. The zealous Reverend had commissioned the house to be built with the intention of luring sinners to its doors with the house’s riches. Once the guests arrived, they were trapped until they repented to the Reverend’s satisfaction. Centuries later, the tradition continues. A group of eight people have avoided paying the consequences of their crimes soon discover they are trapped in this house. The only escape is to repent their evil ways. The problem is no one is truly sorry. Will they repent their evil ways or remain in Blackstone for the rest of their lives? E-Book Available at Amazon, Barnes and Noble, Smashwords, and IBooks. Soft cover copy at Amazon and Barnes and Noble. I had so much fun watching them get pulled into the story even though they knew they were being filmed. And this is why I write what I write. Imagine a room with ten people sitting at a table. One sentence is scrawled across a whiteboard hanging on the wall. A large clock is counting down. The people at the table are focused on the paper or whatever writing implement they have chosen. The minutes go by. The scribbling pen picks up speed. Fingers tapping on keyboards are consistent. The ending alarm chimes. Ten fresh storylines are born. This is the Ten-Minute Writing Prompt. 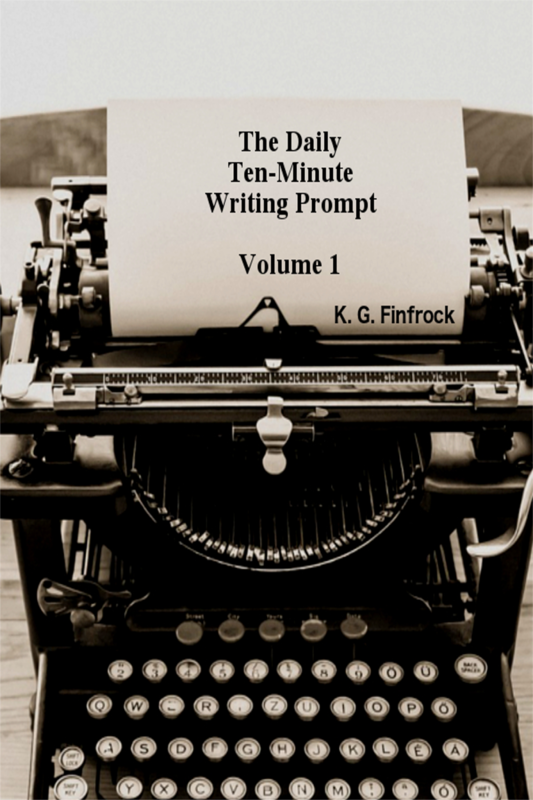 One simple statement or a piece of dialog igniting the creative flame for fiction writers. Take ten minutes of your day to stir the embers and keep the muse strong and alive.